Did you know that blue light could be one reason that your health isn’t the best it could be? Blue light protection is something all of us need in our modern, well-lit lives. Because, as it turns out, blue light isn’t all that good for us. The blue screen of death is aptly named. But what is blue light and why do we need blue light protection, anyway? All light is on the electromagnetic spectrum. Blue light is at the far end of the visible spectrum (close to invisible UV light), on the opposite end from red light. Blue light is a high energy, low wavelength light. This can be good or bad. By itself, blue light is one of the most dangerous forms of electromagnetic frequency (or EMF). Artificial blue light is a relatively recent addition to our human lives. Of course, blue light itself isn’t a new invention- the sun emits blue light. This helps us wake up and feel happier and more alert. It turns on your pituitary gland in the morning. In fact, the high energy of blue light is the reason that the sky looks blue. For the majority of human history, we used fire and daylight to see by. After electricity became a household norm, most lights were still warm-hued Edison bulbs. And then everything changed… we invented LEDs, and found plenty of ways to isolate blue light from the rest of the visible light spectrum. This gave us a pure form of blue light, one we’ve never been exposed to before. And our lights got brighter and brighter. In these modern times, we don’t spend much time outside, in natural light. We’re absorbing tons of blue light. 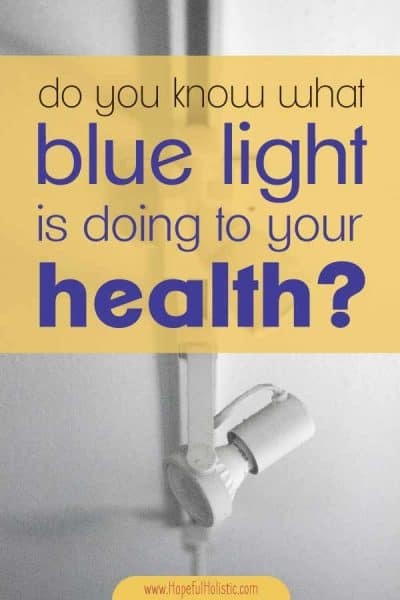 And artificial blue light can be extremely harmful. Today, there is blue light all around us. It’s coming from our phones, iPads, and computers. TVs emit blue light and we watch way too much of it. You can’t really get away from blue light- it’s even blinking away on machines and in cars. This is because, since blue LEDs are relatively recent inventions, their blue hue is seen as being more “futuristic” looking than red lights. So companies stick them everywhere -from fridges to Ferraris- to make their technology seem more advanced. The majority of our exposure to artificial blue light happens at night– that’s when we’re watching movies, TV, and staying up late under artificial light. This is also when it’s the most dangerous. This massive increase in blue light exposure at night is affecting our wellbeing- especially because the harmful effects aren’t immediately obvious. So how does blue light affect us? This new nighttime light form isn’t like the warm, soft firelight that we humans have been looking at for thousands of years. Separated from the rest of the visible light spectrum, blue light can become incredibly harmful. Read on to see how artificial blue light might be affecting your health. Even though one look at artificial blue light isn’t harmful, light has a cumulative effect. Over time, blue light exposure can eventually lead to age-related macular degeneration (AMD) and other retinal harm. People who are constantly exposed to blue light, such as people who work with computers or play lots of video games, as well as the elderly, are probably at higher risk for damage to their retina and eyesight. When you look at blue light, it goes straight through your eyes and directly into your pineal gland. This is a gland in your brain that sits right in the middle of your forehead. It’s also called the third eye. This gland is in charge of melatonin production, among other things. I’m sure you’ve heard of melatonin and its importance to sleep, but it is even bigger than that! Melatonin is a major antioxidant in the body, and its production is inversely related to health issues. This includes cancer cell activity. Less melatonin, more cancer cell activity and growth. As melatonin production decreases because of blue light, your risk of diseases, including cancer, increases. Yes, this happens slowly, but that almost makes it more dangerous– if artificial blue light were to immediately kill hundreds of people upon exposure, it’d be banned in a jiffy. I feel that way about a lot of things- like toxic store-bought cleaners. They’re awful for you but no one gets sick from using them once or twice. The effect is cumulative. Not sleeping well and having unbalanced hormone levels can cause fatigue and negatively affect your energy levels if the causes aren’t dealt with. In fact, blue light exposure at night can actually shift your circadian rhythm for up to 48 hours. What this means is that you’re effectively giving yourself jet lag every time you’re exposed to blue light at night! And it definitely means you’re not going to sleep great. Read on to find out how you can protect yourself from these harmful effects! So, artificial blue light is obviously a problem. But how do you protect yourself when blue light is everywhere? Here are some tips for reducing your exposure to blue light, and the best method of blue light protection I’ve found is at the bottom! Even though artificial blue light is a relatively new addition to our lives, there are already plenty of filters that you can install for your screens to protect yourself. These filters cause your computer, iPad, or phone to shift to a warmer, dimmer lighting at night. You can download f.lux for your computer, and search for either Night Shift for iPhone or Blue Light Filter – Night Mode for Android devices. And best of all, they’re all free! Some computer operating programs (including Windows 10) have this function installed automatically too- just search for “night light” under settings to get started! I think it’s awesome that there’s a preinstalled blue light filter app for PC. Sometimes, you just can’t control blue light exposure. There’s no filter you can download for movies or public spaces! Luckily for us, someone brilliant came up with the idea of blue light blocking glasses. These glasses have an orange tint (some glasses are more orange than others) to help decrease the amount of blue light that your eyes are exposed to. When you’re buying new prescription glasses, some places give you the option of adding a tint to your glasses for an added price. There are also separate, non-prescription blue light glasses you can buy. And they aren’t expensive! Mine cost about $15. When I first started looking for glasses to wear at night, I found lots of blue light blocking glasses that were apparently super-scientific and verified to block blue light- which all translates to expensive. I opted instead for a more affordable pair, the Gamma RAY vintage computer glasses (with a black vintage round frame!). They come with a carrying case and cleaning cloth, and they really do help with eyestrain and blue light! Since I started wearing these at night, I’ve seen a noticeable difference in how tired my eyes feel after watching a movie or seeing bright lights. When I’m not wearing them and I get on the computer or something in the evening, my eyes quickly feel strained and I feel tired but buzzed, and I usually don’t sleep very well. Wearing these at night, though, help me feel ready for bed and I usually get to sleep quicker! Overall, I’ve been very pleased with my blue light protection glasses. They’re durable, affordable, and they fit me perfectly! I have a larger-than-normal head (for a woman) and a larger-than-normal bridge on my nose, so lots of glasses give me headaches after I wear them for a while since they squeeze too tight. But these ones fit great! They work fine for people with normal-sized heads and noses too. =) They also fit over my prescription glasses too, which looks kinda dorky, but hey, it works! My husband, on the other hand, needed glasses that were a tad bigger, and he went the Vseegrs blue light blocking glasses. They cost a bit extra, so I was sure they’d work just as well, if not better. But guess what? They’re already falling apart! More expensive and flimsier too? I think I’ll stick with Gamma Ray glasses. I find that my blue light blocking glasses are especially helpful whenever I’m watching a movie at night, and they’re also super useful when I’m out and about late at night. Places like airports, shopping centers, and grocery stores can all have glaring artificial blue light sources, and wearing my blue light blocking glasses to these places can help my eyes feel better and make me feel less worn out afterward! As an introvert, that’s huge. I love coming home and not feeling completely drained just because of the bright lighting in an area. When you do get to be home though, you have complete control to change your light bulbs to something less harmful. Many types of lights can be harmful to your health because of the amount of energy in their wavelengths. One of the worst types of light bulbs is compact fluorescent lights (CFL), which have tons of blue light. They also emit mercury when they’re new! You can toss those any time you want. I’ll wait. Ok, wanna know your best choices for replacement bulbs? First on the list is warm incandescent bulbs. They’re easy on your eyes and don’t emit much blue light. The next best choice is LEDs, but they vary in their emission of EMFs and blue light, and they can be pricey. Some other good choices for lighting include warm nightlights, (so that you don’t blind yourself when you use the bathroom at night) Edison bulbs (which are low-wattage and snazzy as heck!) and my favorite, salt rock lamps (which not only look nice- they’re good for you for numerous reasons!). You can also try lighting your evening with candles! Pretend the power went out and get cozy with your partner or pet. Just make sure your candles are all-natural so you aren’t breathing in toxins! Look for 100% beeswax candles with cotton wicks. I like these taper candles and these tea light candles! As you read above, blue light is one of the most dangerous forms of electromagnetic frequency, or EMF. One way you can reduce the damage done by blue light exposure is to invest in some EMF shields. EMF shields won’t make blue light disappear, but it can protect you from the radiation that comes from numerous sources, including blue light, cell towers, smart meters, and your cell phone. Shielding yourself from EMFs can help you sleep better, have more energy, decrease arthritis, reduce your risk of disease, and tons more! Aires Tech is the company I use and recommend. They’ve put over $20M into R&D- they know their stuff and it really works! How do I know it works? First off, I feel better. Also, I brought my EMF shields to my naturopathic doctor and he did a test to see if my body was responding positively or negatively to the shields. He found that my body really did want the protection my shield provided! This is true for anyone since EMFs are everywhere, and unhealthy for everyone. I use a Shield Pro on my phone and carry an Aires Defender Pro on me everywhere I go. There’s also the super-powerful Aires Guardian, which can be used to protect entire rooms from EMFs. And if you’d like to save some monies on an EMF shield, use code “hopeful10” at checkout for a discount! This code can also be used on top of their sales, which they offer regularly! All of these options are great for reducing your exposure. But do you want to know which is the BEST method for protecting yourself from blue light? Here it is: don’t use just one or two methods! Use them all. Stack up protection. That’s the best way to protect yourself from the dangers of artificial blue light exposure. So get some blue light blocking glasses, and bring them with you when you go out at night! Let that nasty CFL light go out. Get filters for your phone and computer, but try not to be on them too much at night anyway. Buy some Edison bulbs and a salt rock lamp to light your house at night (and make it look warm, romantic, and incredible!). 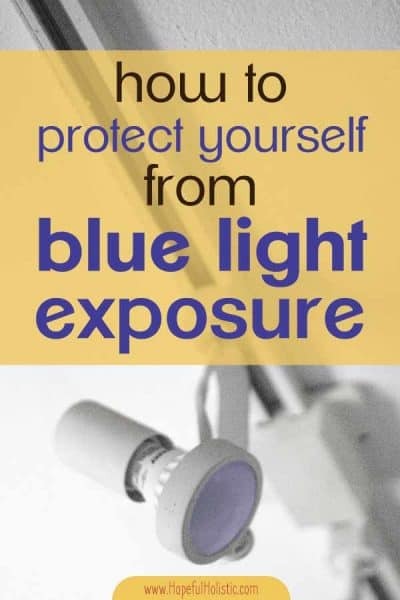 Do all you can to reduce your exposure, and increase your blue light protection, because you never know when you’ll be exposed. The less your body has to deal with, the more it’ll be able to stand up to the unhealthy stuff (think toxins, chemicals, and viruses) that inevitably come your way! There’s much more than just artificial blue light that you need to be aware of, though. If you’d like to know more about minimizing the toxins you’re exposed to on a daily basis, you can check out my free guide to reducing toxins! I’d also highly recommend learning about your human design. Human design is a way to understand your unique energy blueprint. It’s a synthesis of eastern and western astrology, the Judaic Kabbalah, the Hindu Chakra system, the Chinese I’Ching, and quantum physics. Learning about your human design strategy can help you protect your energy better by guiding you towards authentic living, better sleep, better decision making, and an overall understanding about how you personally take in, create, and manage energy. Do you think you’ll start using any of these techniques? Do you do any of them already? Let me know in the comments below!